If water is the world’s blood, then rivers are its veins and arteries. Look at any topographical map or read about the Nile or Amazon River in websites and books, and you will easily see that the lands near these bodies of water teem with life. Freshwater fish, crustaceans, and even marine fauna from the sea dwell in rivers. Innumerable terrestrial animals treat rivers not just as homes but also as rich hunting grounds. Human communities, from tiny settlements to the largest cities, lay on riverbanks to have easy access to the water for their needs, from drinking to producing electricity. Just like all things, humans, with all their creativity and thirst for an adrenaline rush, made rivers havens for adventure. 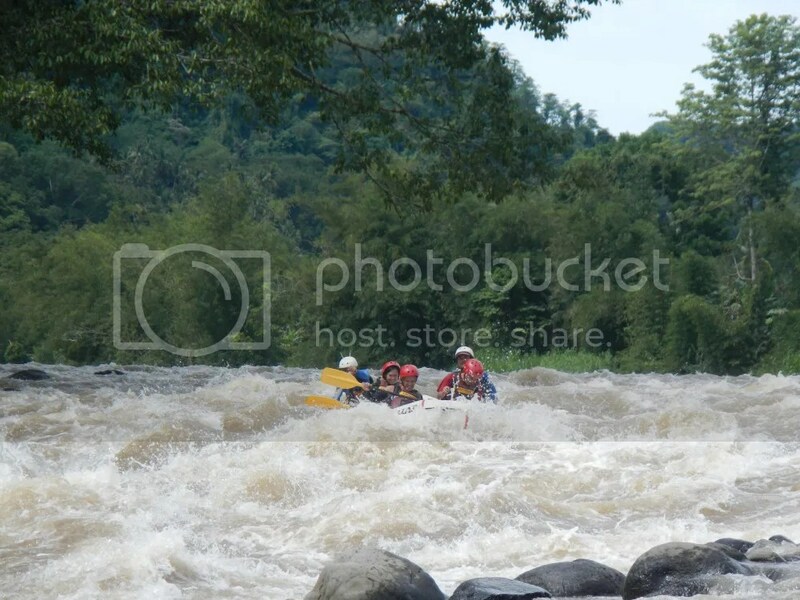 And in Cagayan de Oro in Northern Mindanao, Philippines, adventurous Cagayanons made the mighty Cagayan River their playground for an adrenaline-inducing adventure called whitewater rafting. Developed in the mid-70s, whitewater rafting is a challenging, fast-paced, extreme outdoor activity that involves riding an inflatable raft to navigate a river. 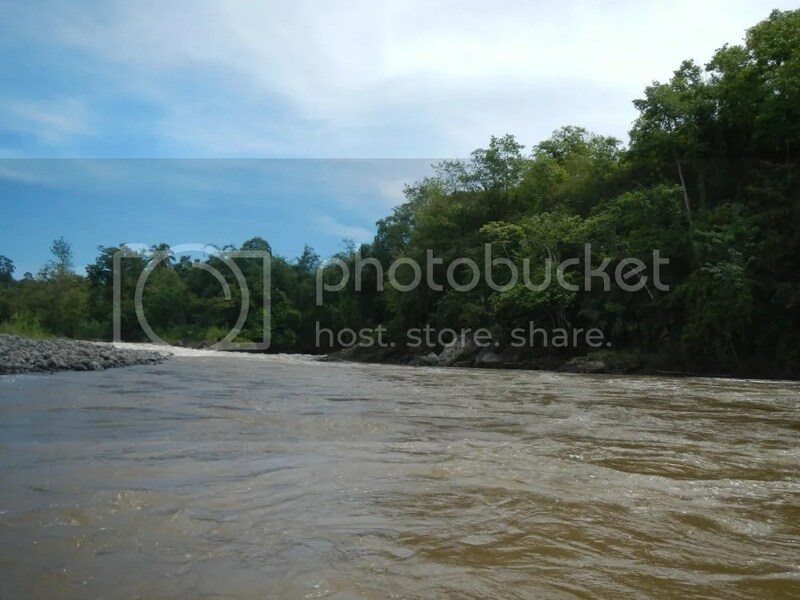 To make the ride more interesting, the raft rides through various degrees of rough water in the river. 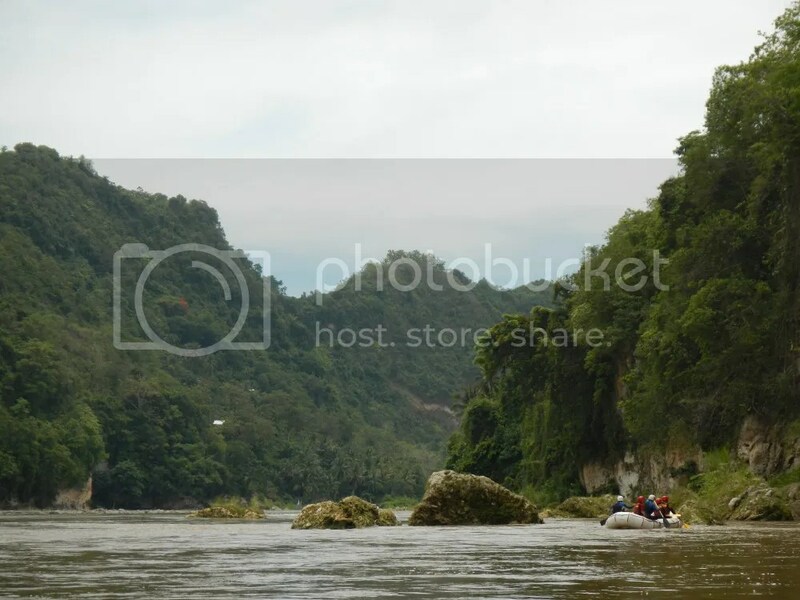 And in the Philippines, the Cagayan River is the most popular site for the country’s whitewater rafting scene. 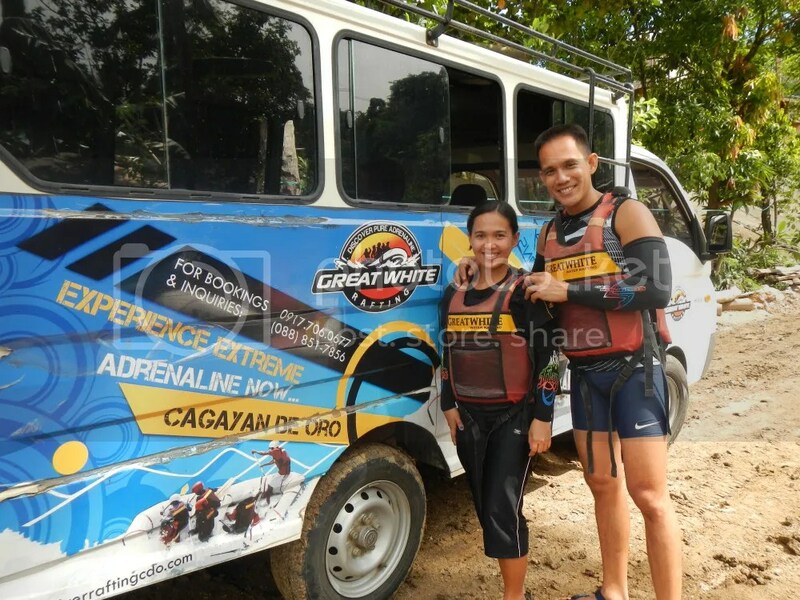 Of course, Sweetie and I, ever thirsty for the next exciting and extreme adventure, decided to try out this wet, wild, and potentially dangerous sport last May 31, 2013. Little did we know that this would become one of our favorite and best outdoor experiences. 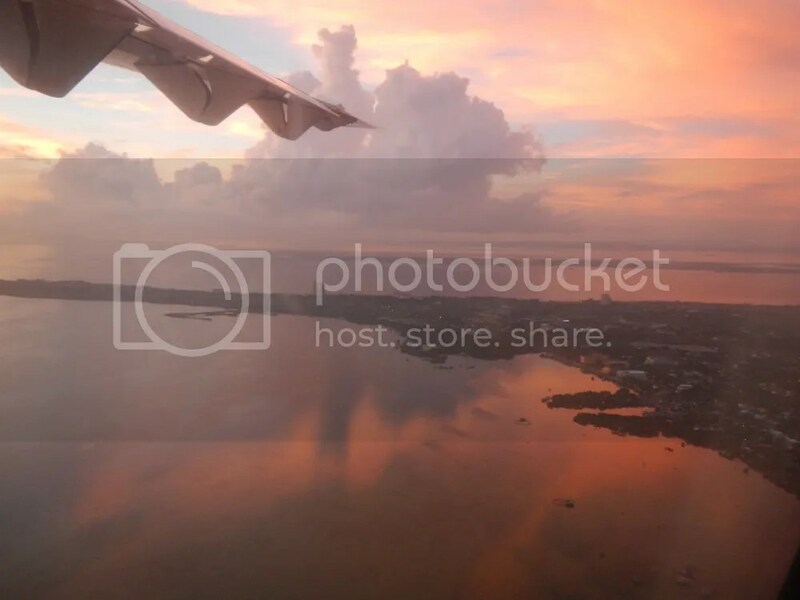 The day dawned with a promise of an excellent time, marked by a golden, pinkish sunrise as we left the Mactan International Airport. Witnessing such stunning views like that in the photo below is the reason we love flying during sunrises and sunsets. After an hour high up in the air, we finally descended towards the airport of the City of Golden Friendship. 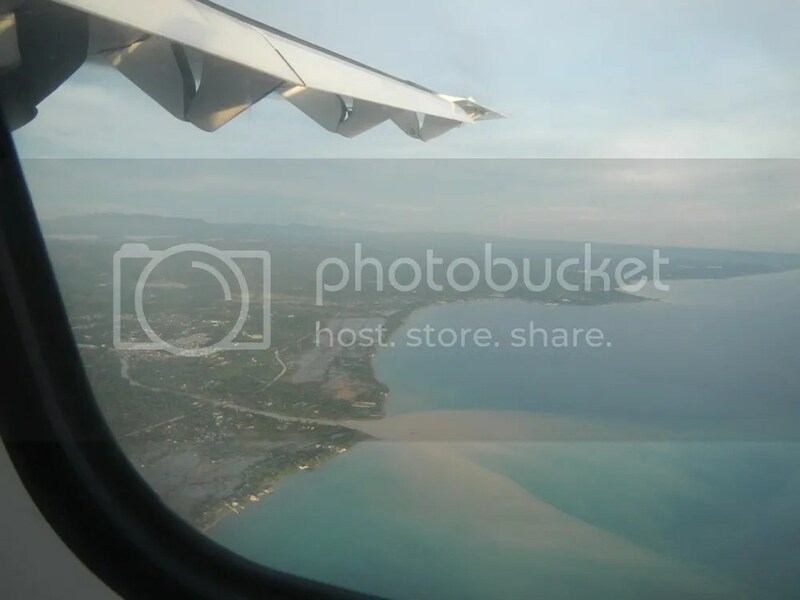 At this point, we could see the mighty Cagayan River, spitting brownish silt out in the sea. Later, we’ll tell you why this is the ideal condition for river rafting. We arrived at the Cagayan de Oro airport at around 6:45 AM. 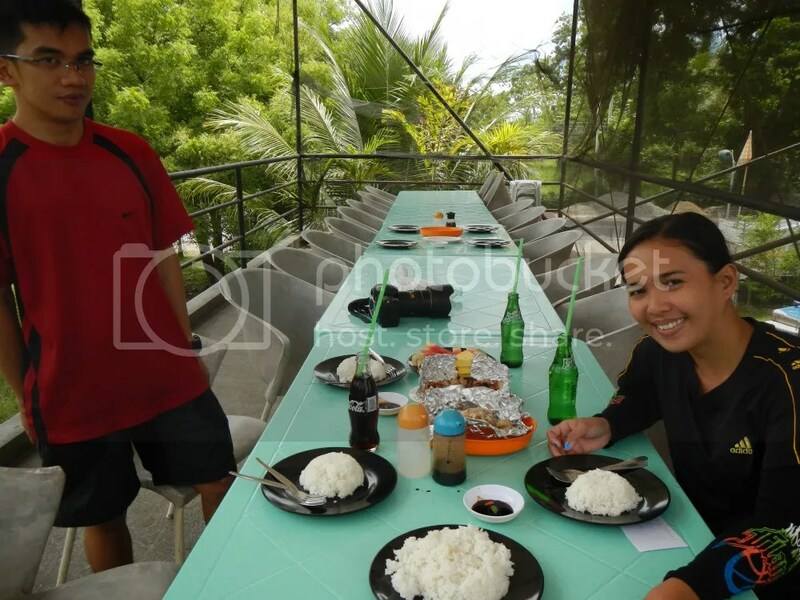 Our outfitter said that they will pick us up from the airport at 7:30 AM, which left us a lot of time to enjoy a hot, traditional Filipino breakfast. Licensed and professional guides employed by our outfitter, Great White Water Tours, fetched us at the airport at 7:30 AM and took us to their office where we can register for the adventure, sign waivers, and prepare ourselves. It only took us 10 minutes to reach the Great White Water Tours’ office since it is very near the airport. 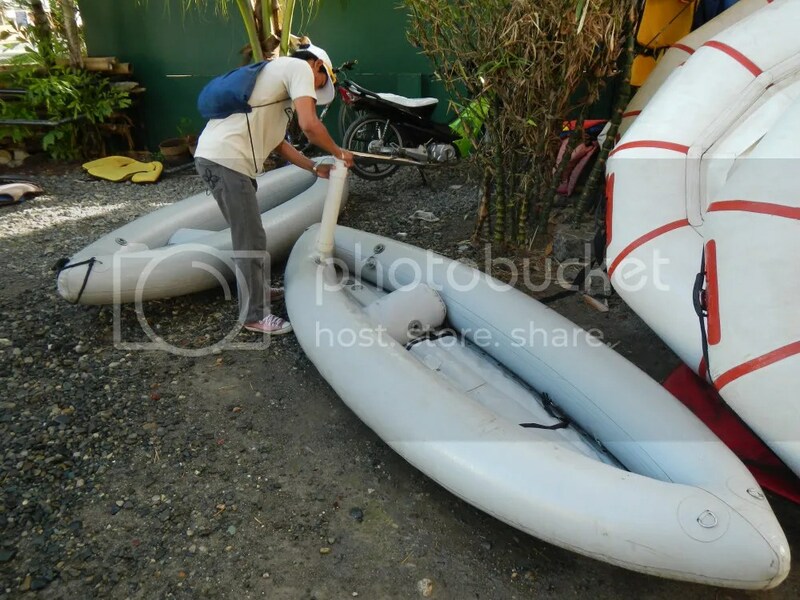 As we entered the clean, gated compound, we couldn’t help but feel safe and secured as we saw how well they maintained their Sotar rafts, life jackets, paddles, and other equipment. 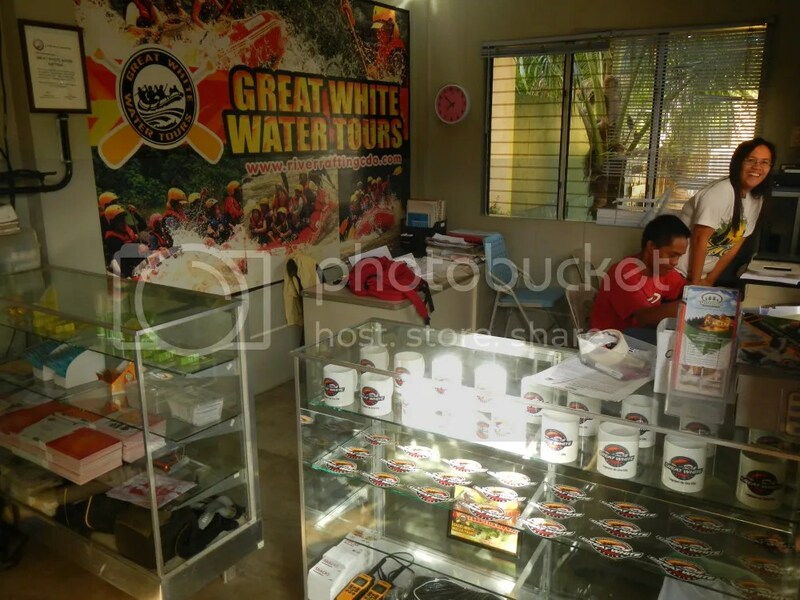 That’s the neat, clean office of Great White Water Tours, which, we found out, is the sister company of the famous Dahilayan Adventure Park in Bukidnon. 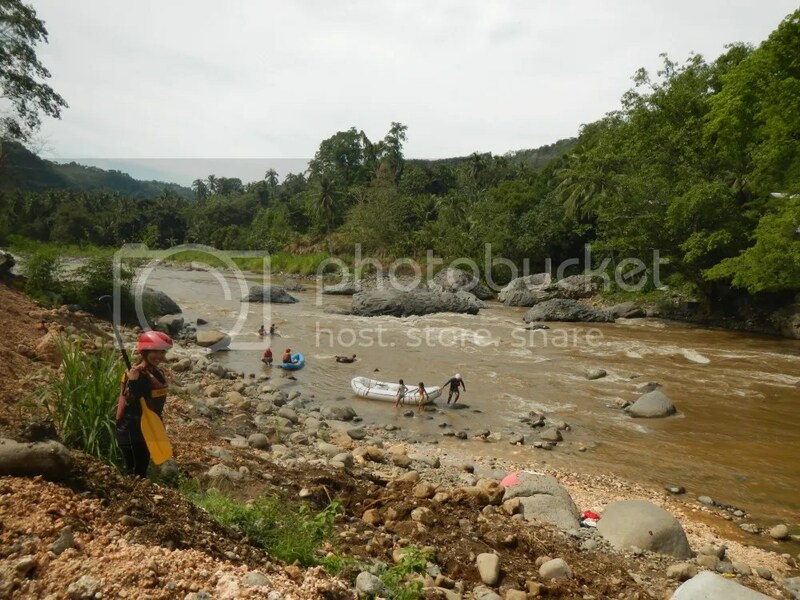 The office has comprehensive facilities such as a storeroom for clients’ belongings, storage area for rafting equipment, restrooms, showers, and a balcony. Clients can also buy stickers, mugs, shirts, and certificates as souvenirs as well as more practical items such as mosquito repellents, lanyards, and radios. Our guides had to head out to the city to fetch another group that will be joining us. While waiting, we took shots of the preparation process. 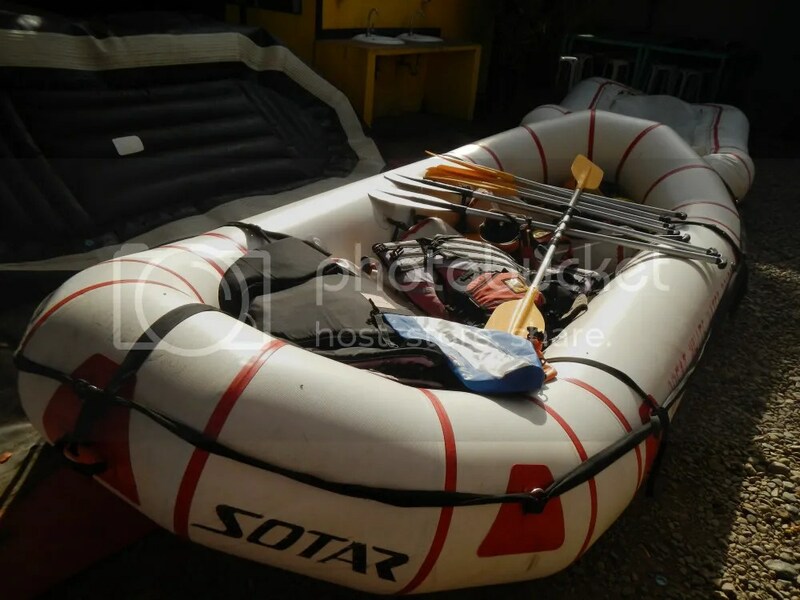 Here, a member of the staff inflates a Sotar inflatable kayak. During the rafting adventure, a professional paddler and photographer will ride this kayak ahead of our raft to take photos of us. These kayaks are also available for rent for experienced rafters who want to enjoy the adventure by themselves rather than with other groups. That’s our Sotar raft, up and ready to go! High-quality inflatable rafts such as this one are constructed out of very tough, very durable, multi-layered rubberized hypalon or PVC. In the unlikely event that the raft gets punctured in action, it still remains afloat thanks to its independent air chambers. 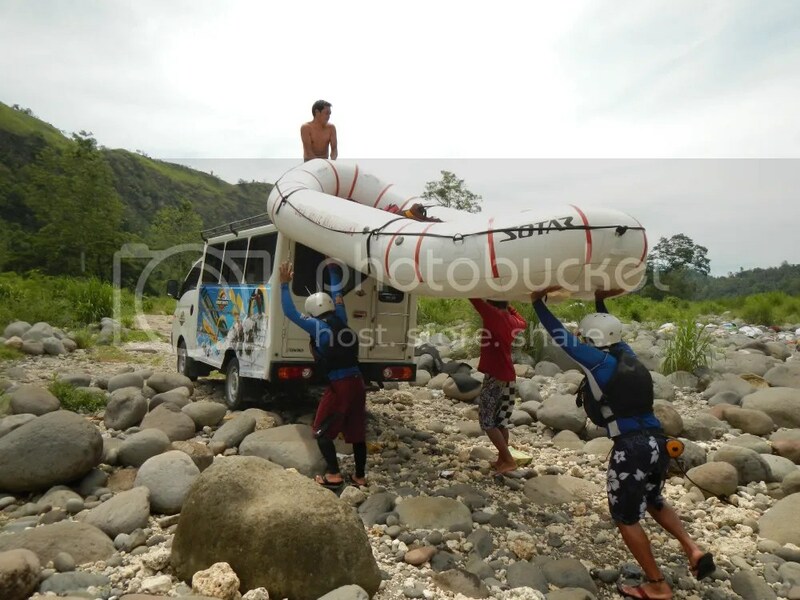 After the guides arrived, the raft and other equipment were loaded to Great White Water Tours’ service vehicle. Sweetie and I were giddy with excitement to get this adventure started. We never expected that we’d have a little extra adventure as a warm-up. 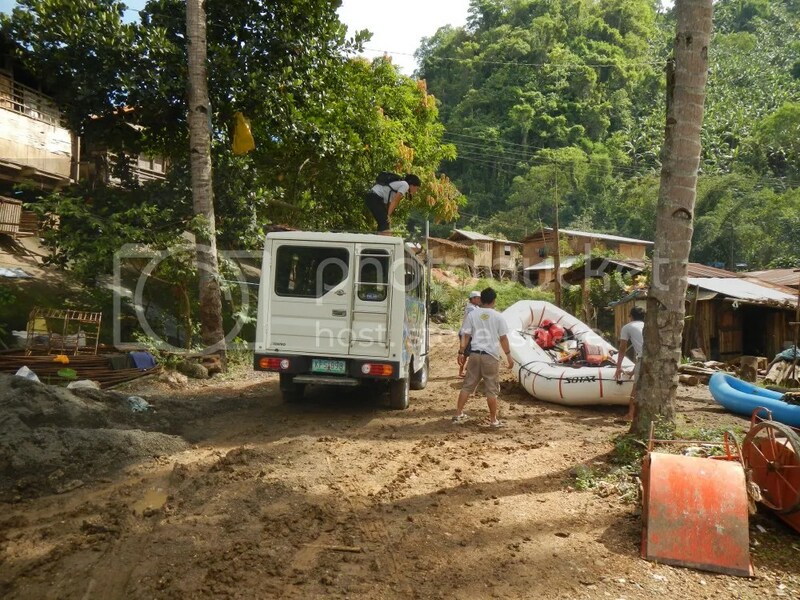 On our way to the staging area in Barangay Uguiaban, the team made a stop at the historic Makahambus Cave. The entrance to the cave is just right beside the main highway. Best of all, we didn’t need to pay a cent to go inside the cave. Those are the two markers on both sides of the cave. 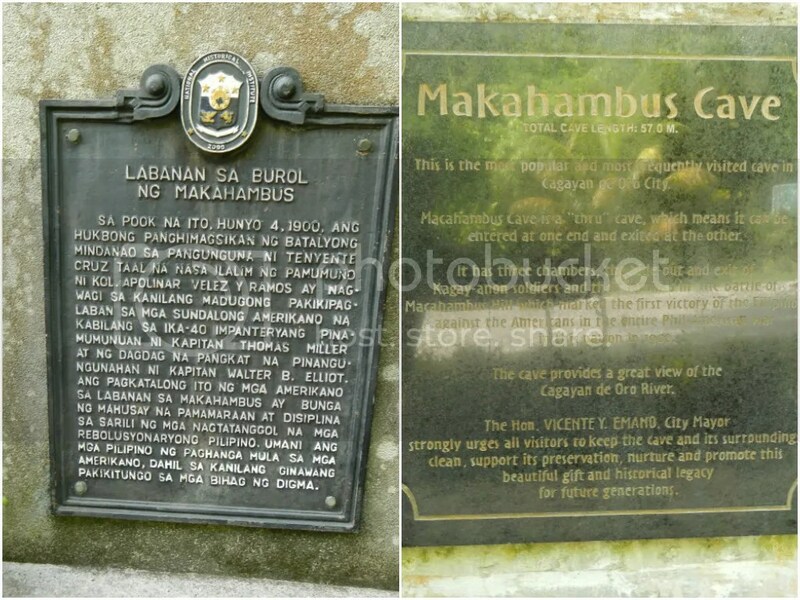 Makahambus Cave is just a short cave, around 57 meters in length, but Cagayanons consider it as an important landmark. 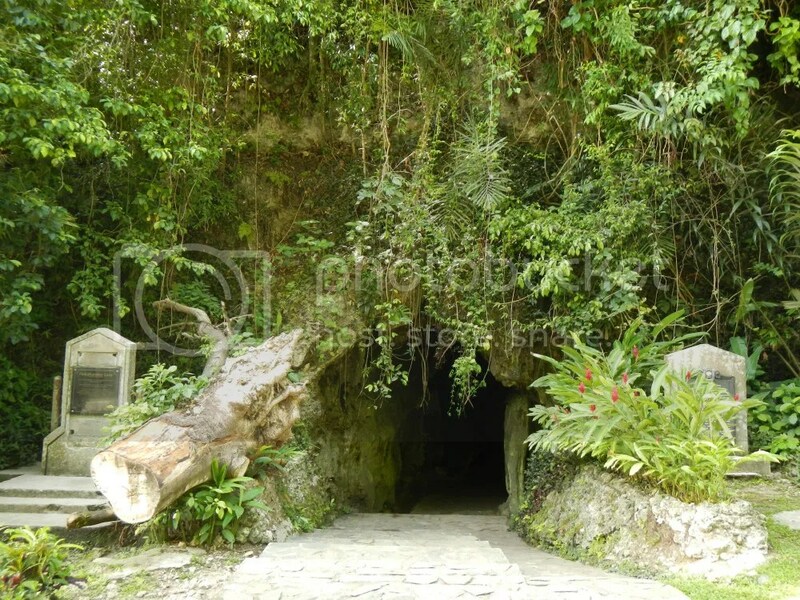 That’s because it was in this cave’s vicinity that Filipinos first tasted victory over our American conquerors during the Philippine-American War (also known as the Philippine War of Independence) in 1899 to 1902. Most likely, our boys used this cave as a hideout. 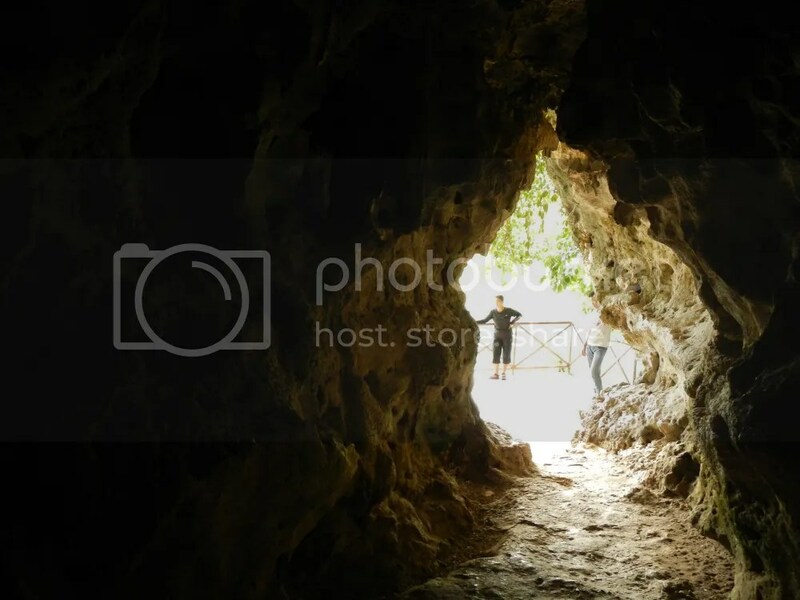 Makahambus Cave is a short but relatively cavernous tunnel cave with a crawlspace between the entrance and the exit. It was just a short walk that involved a bit of squeezing in and bending down. The nice thing about Makahambus Cave is that it’s very well preserved even though it is regularly visited. The exit of the cave, which is actually at the side of a cliff, features a fenced viewing platform. 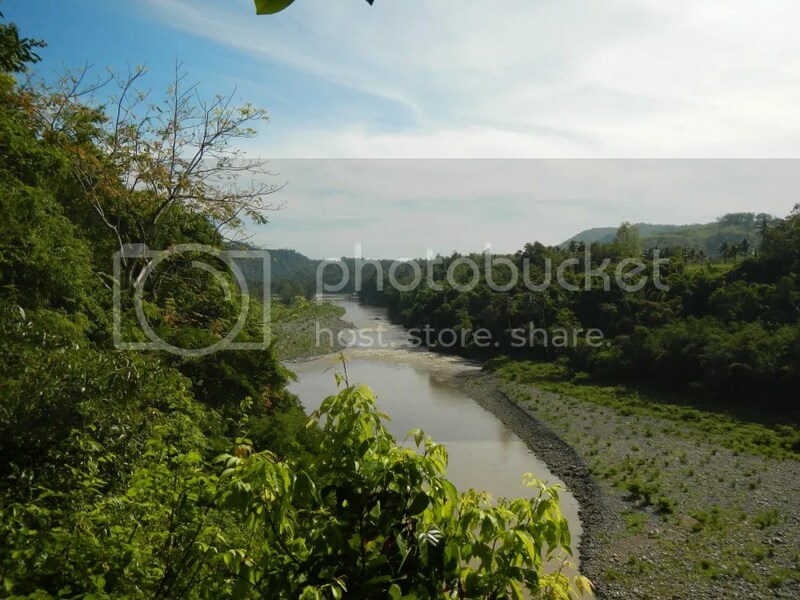 From the platform, we could see an awesome view of the Cagayan River, which is actually one of the major rivers draining the waters of Mindanao. See the faraway whitewater sections of the river? Our guides told us that those rapids are part of our route! Cool! After a few minutes of taking photos and surveying the river, we went back to the highway via a narrow but fenced ledge at the side of the cave. Wohoo! Another mini-adventure! It took us half an hour to reach our jump-off point in Uguiaban. 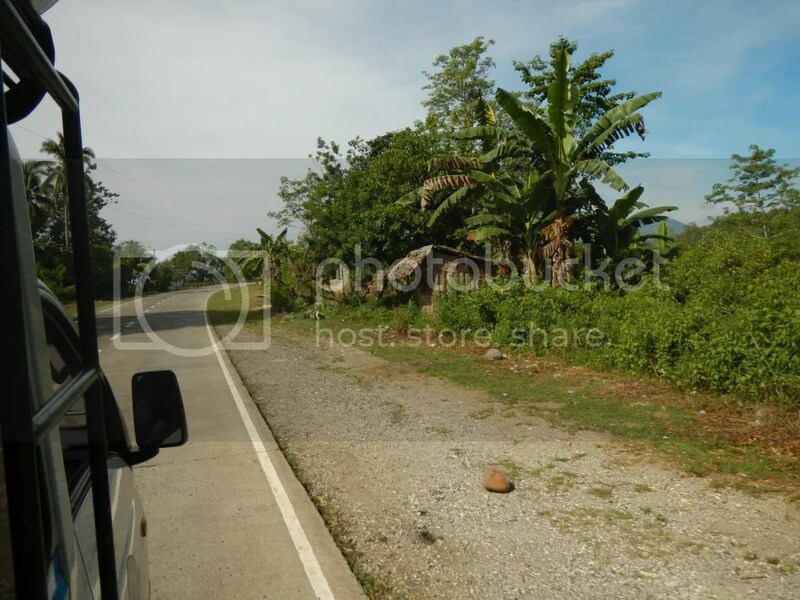 The scene was breathtaking, much like what you usually see when you go to Lutopan via the Manipis road. Snippets of local, rural life are always small wonders to behold. We didn’t waste any time. Upon reaching the jump-off point at Uguiaban, the guides unloaded the raft while we suited up in our rash-guards and life jackets. After everything was ready, the outfitter’s service vehicle headed towards the end exit point of our adventure where they waited for us. 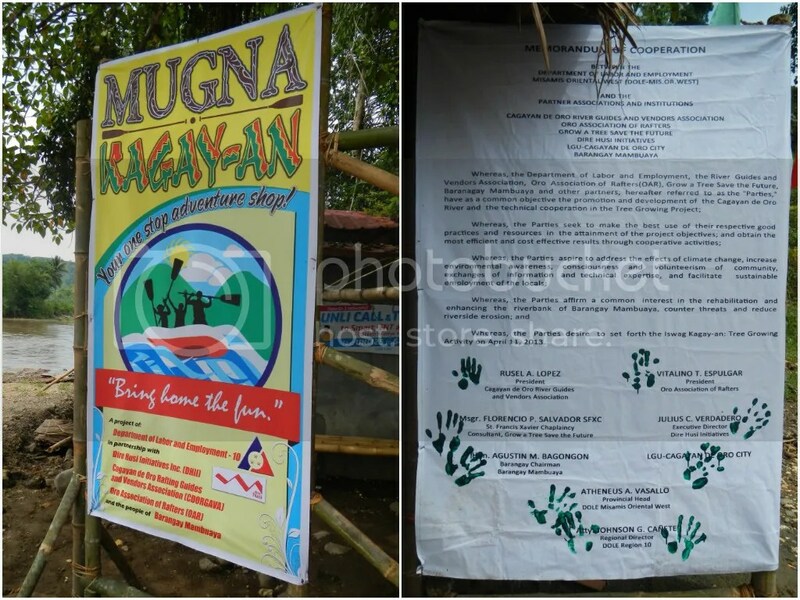 Barangay Ugiaban is the starting point of Great White Water Tours’ Advanced Course, which we were booked in. All set and excited to go! One of our cool guides, Sir Johnmark Lamoste, briefed us on the basics of rafting. Of course, he taught us how to paddle properly and heed command words. The briefing was extremely comprehensive. Retrieving a person who falls off the raft, floating properly, swimming in the right direction, safety features of the raft, and other important precautions were thoroughly discussed. By the way, the guy on the left is Sir Marc Apilado, a fellow adventurer and photographer from Manila. His team and Team Sweetie were supposed to be booked as a single group. 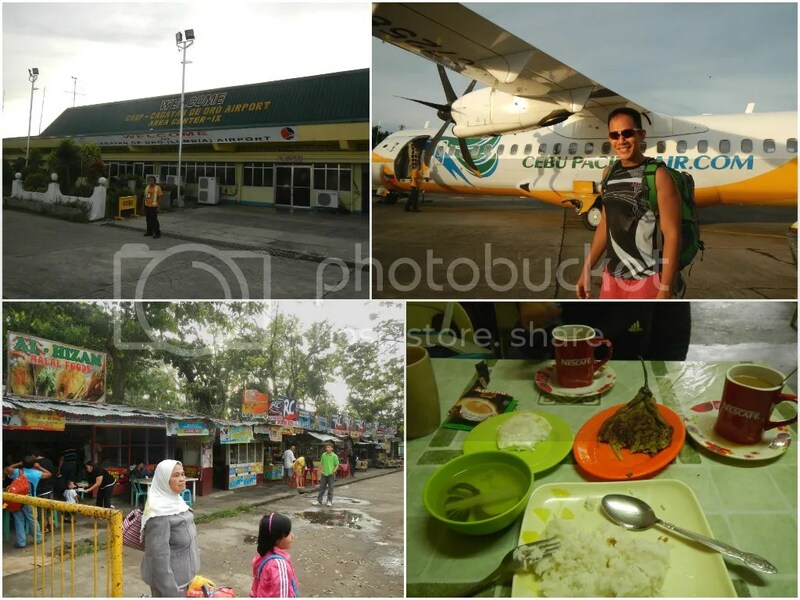 However, he was the only one able to push through to Cagayan de Oro; the others weren’t able to catch their flight. After the thorough briefing, we were actually ready to ride the wild. 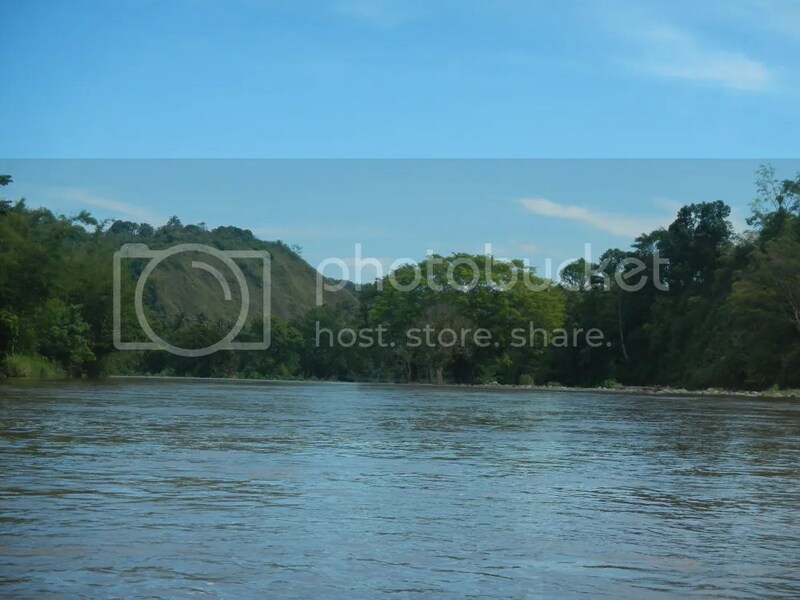 That is the mighty Cagayan de Oro River, which serves as an immediate natural boundary between Bukidnon at right side of the river if you’re heading downstream and Cagayan de Oro City at the left. 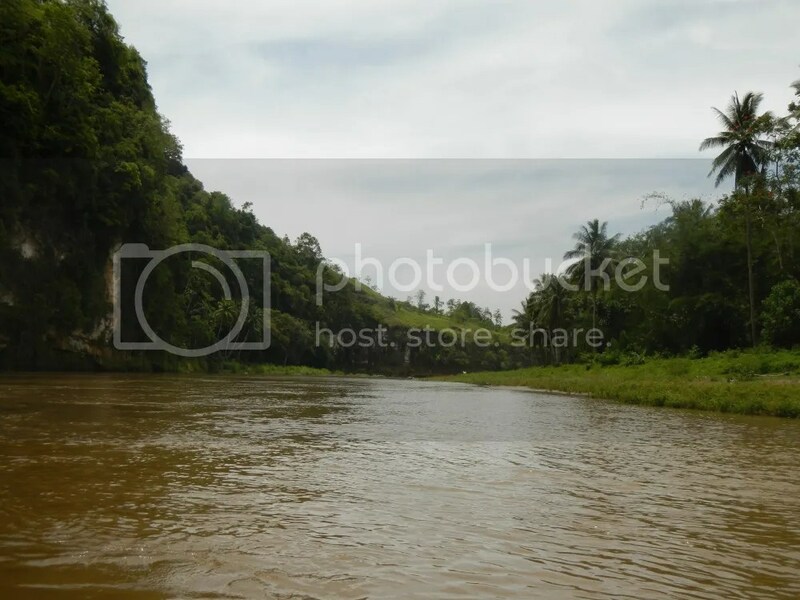 The river’s source is located in the Kalatungan Mountain Range at the central part of Bukidnon and empties into Macajalar Bay in Cagayan de Oro City. We were whooping with excitement as we boarded the raft while Sir Johnmark and his partner Sir Ruben Victorillo prepared to cast off. And then we were off! In just a few minutes, we encountered our first rough water experience. Sir Ruben said that this one was just the warm-up. There were still 21 more rapids to go! 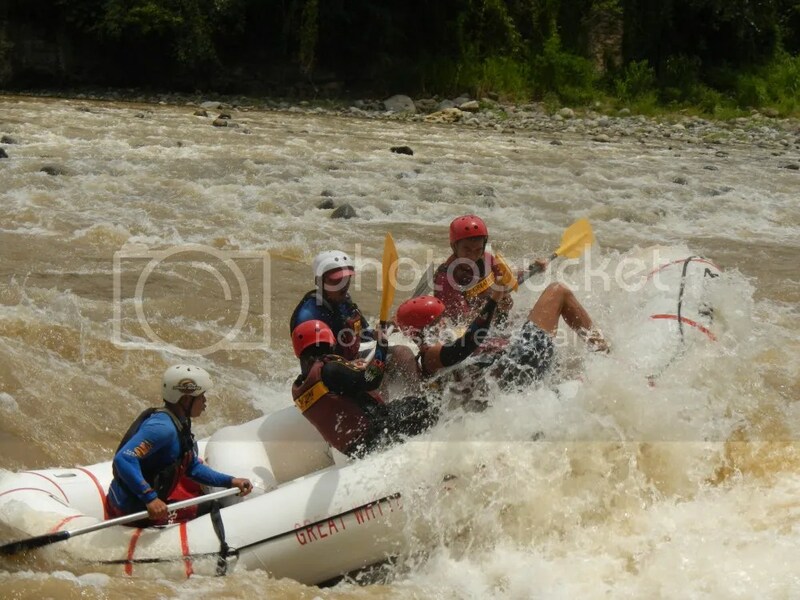 The Cagayan de Oro City government and the Department Tourism have recently made whitewater rafting in the river as the region’s banner tourism activity. And indeed, it was more than what we expected. Slam! The water’s force was so strong that it literally rattled our teeth! Our first taste of rafting and we were thoroughly enjoying this wet and wild adventure. 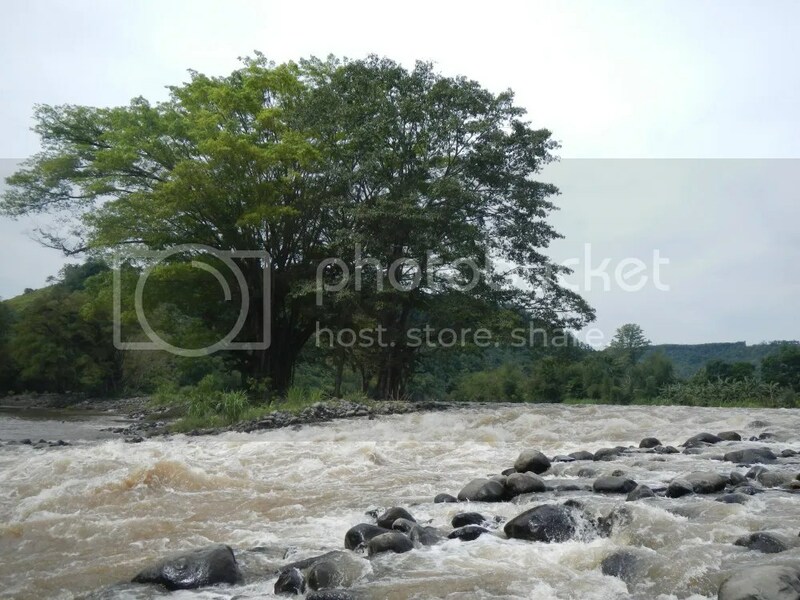 Rapids are usually formed in places where the riverbed is quite resistant to the erosive strength of the river. We also encountered this powerful Class 3 rapid. See how powerful the water is? If we remember correctly, this is an area where one of the four main tributaries converges with the Cagayan de Oro river. Certain areas of the river between rapids are extraordinarily calm. The serenity is nothing less than spiritual as we quietly enjoyed the magnificent scenery as we passed by. In these calm waters, we jumped off the raft and had a refreshing swim. The feeling of being in the cold water, not doing any stroke but just moving along with the river’s current, is indescribable. To say that we felt as if we were one with the river is an understatement. “Rapids ahead!” Every time Sir Ruben or Sir Johnmark calls out this command, we hurriedly scrambled back up the raft. Can you see the whitewater in this photo? 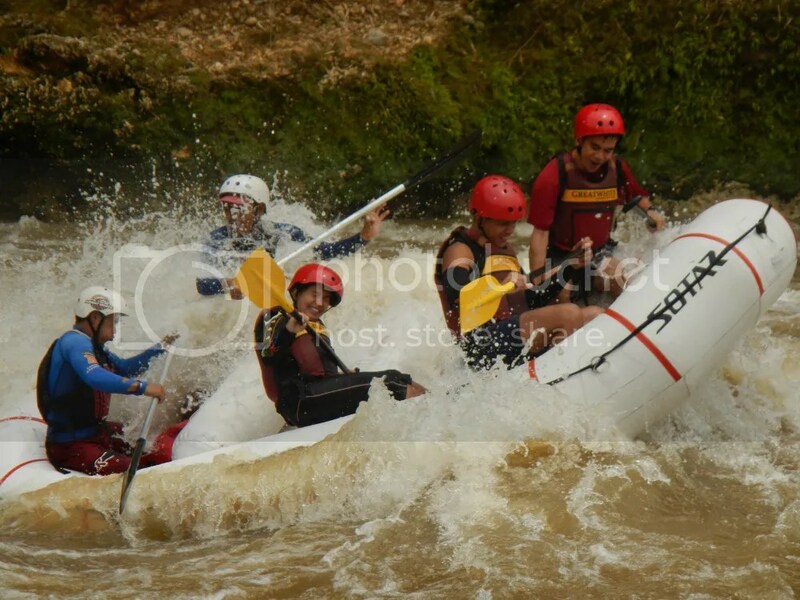 Our guides expertly maneuvered the raft sideways to lessen the chances of a wipeout. Sir Johnmark earlier explained to us that they look for tell-tale and subtle river-current signs to determine the safest and the best possible way to negotiate the rapid. In other words, you don’t just ride the river, you read it! Hmmm . . . Sweetie and I just found a new recreational activity in our repertoire. If only there was a large, strong river in Cebu . . .
After a couple of hours of furiously paddling, keeping our balance, and thoroughly having the time of our lives, we docked at Barangay Mambuaya where souvenir shops were stationed. Be sure to bring in some shirts, refrigerator magnets, lanyards, and other souvenirs to remind you of your wet and wild escapade. 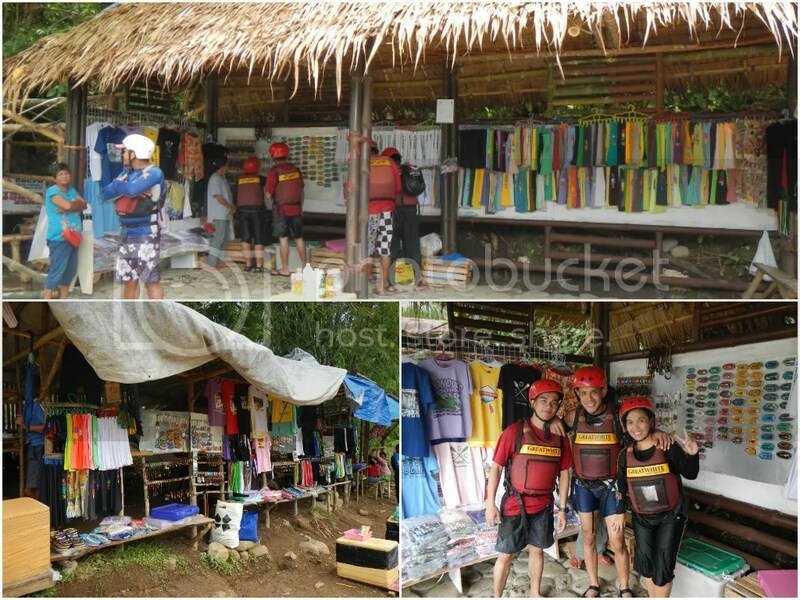 Barangay Mambuaya is also the starting point of Great White Water Tours’ Basic Course. By purchasing hand-made souvenirs, you are helping the community and taking an active part in promoting Cagayan de Oro’s tourism. In all our backpacking trips and mountaineering expeditions, we observed that these humble communities are all actively involved in carefully preserving and proudly promoting their offers. Personally, we find these communities’ efforts and actions in tourism and environmental protection far more impressive than those of big cities. 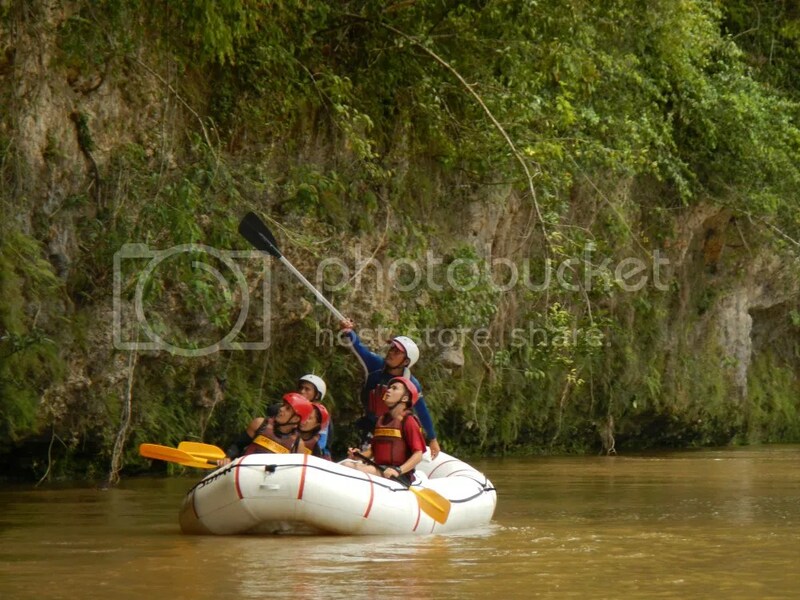 While we rested, drank some soft drinks, and chose souvenirs, another group of rafting enthusiasts passed us by. 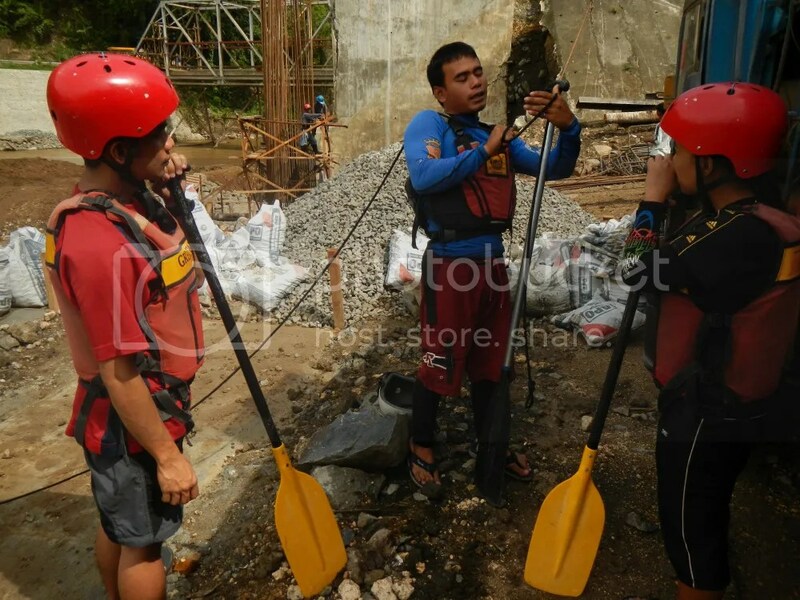 There are several rafting outfitters in Cagayan de Oro City. After the refreshments, we were ready to take the river again. The rapids started almost immediately after casting off from the riverbank. Normally, the outfitter takes a minimum of 5 rafters (excluding the guides) to a maximum of 10. The extra weight of so many people in the raft causes the hull to ride deeper into the water. With the extra weight and draft, the raft moves slower. As you can see, we were riding high above the waves. That’s because there were only three of us plus the guides. In addition, our raft’s light load enabled the vessel to go faster than usual. It truly satisfied our need for speed. We moved so fast that we actually overtook a group that had a 30-minute head start from us. 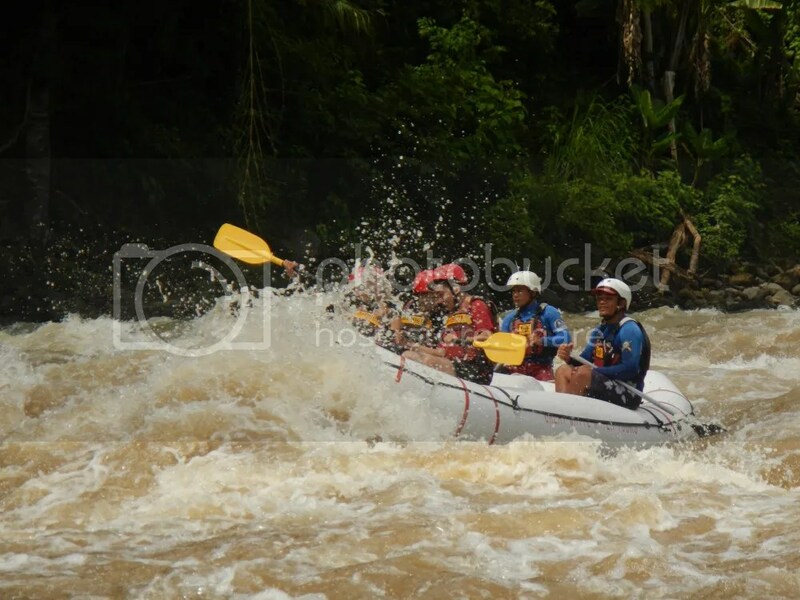 Even our photographers who were paddling a small kayak remarked that they had a hard time catching up with us! Hold on tight! We entered this rapid sideways, trying to tip the raft to its side. But we thought we were just too balanced to make the raft tilt. Hehehe! Negotiating rapids is definitely fun but it also requires teamwork. Our guides reminded us to paddle forward when we entered whitewaters while they maneuvered the raft. Just look at the photo below. We bet your adrenaline would rush to new heights! We found many of these huge trees along the river. If our hunch is correct, this is a Lambago Tree. 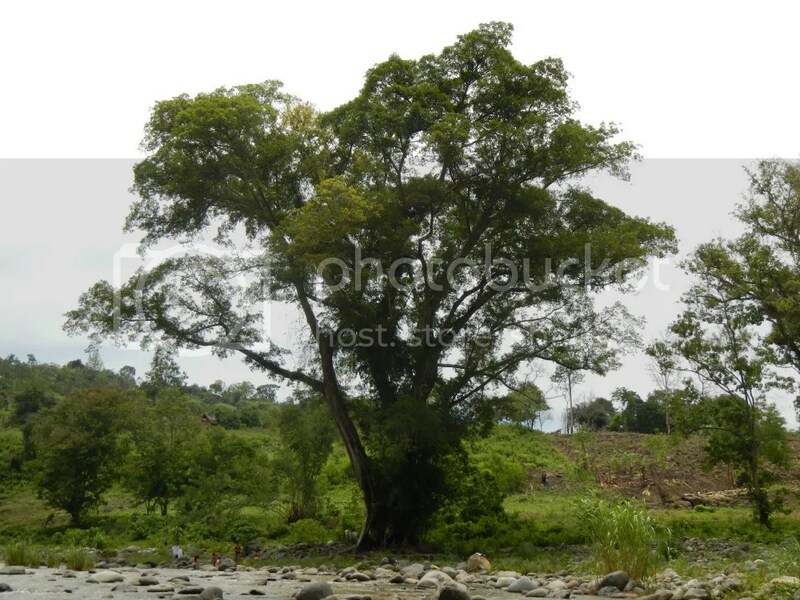 Originally, the river was named Kalambaguasasahan River due to the numerous Lambago trees that thrived near the river. As mentioned before, not all the river consists of whitewater. There were large stretches of calm water where we didn’t do anything but drift along with the current. Along the way, we saw magnificent canyons, amazing rock faces, verdant meadows, and lively communities. Our guides had a nice surprise for us as we drifted along. They bought along the sweetest delicacy of Camiguin, the yummy pastel, a soft bun filled with sweet-butter cream. Mmmmm! Nothing comes close to snacking quietly on the raft while enjoying the mesmerizing wonders of nature. Almost a wipeout! Notice the brown water? This is actually the best condition for rafting. It rained in Cagayan a few nights before, and the extra volume of water vastly contributed to the river current’s strength. 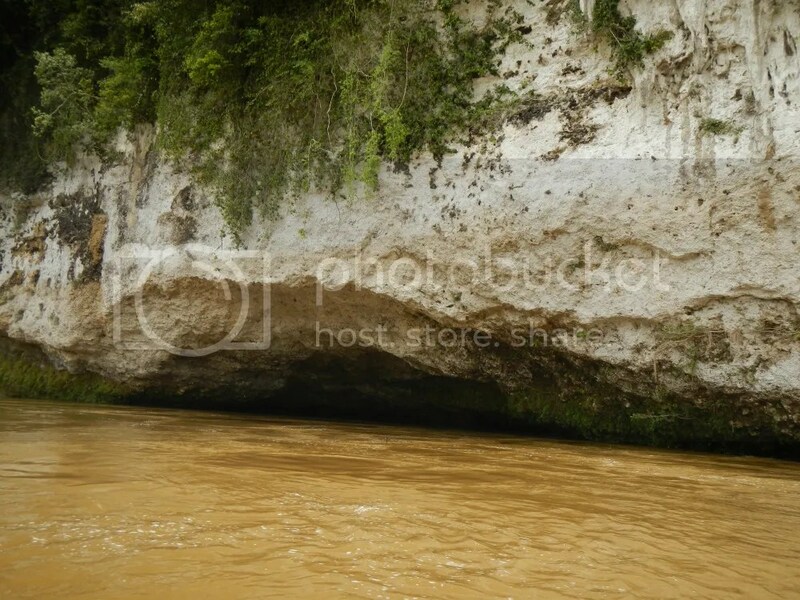 The brown coloration is due to the silt being churned out beneath the water. Don’t be fooled by the river’s color; the water is very clean. As we neared the last few rapids, we encountered this large PPUR-like cavern. Just check out that beautiful cliff! If it was not for the river’s strong current, it would have been perfect for deep-water soloing, a discipline of rock climbing that does not involve any safety gear. The safety and survival of a climber depends solely on the presence of deep water at the base of the cliff. 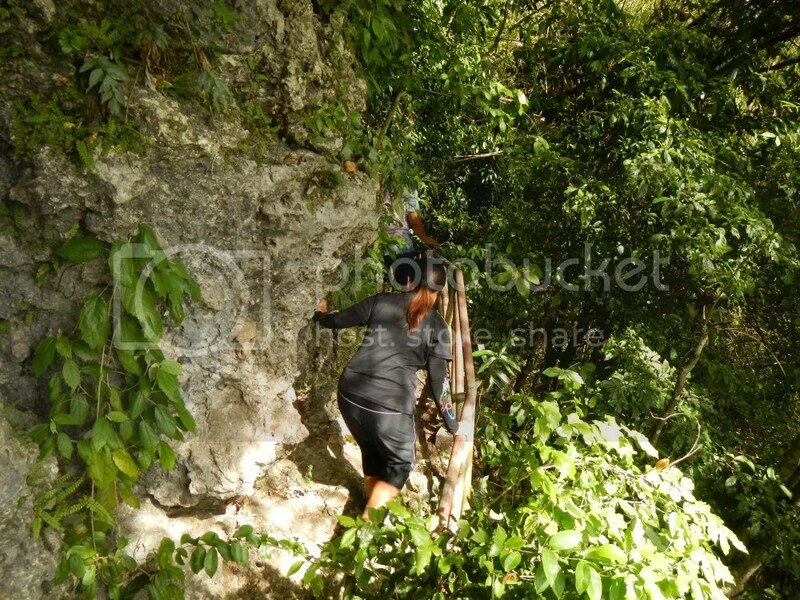 As we approached the cavern, Sir Ruben pointed out very visible holes—and molted skin of huge snakes! He said that the cavern and the cliffs above it is a rich haven of snakes. Yes, we were approaching their home, and everyone felt goosebumps knowing that we’re in Snake Territory. As if dangerously closing in on Snake Territory is not enough, we actually went underneath it! It was a hair-raising moment, knowing that snakes can fall on us any time from those mosses, stalactites, and cavities. One of the last few rapids is a very difficult Class 4 rapid. According to the International Scale of River Difficulty, a Class 4 rapid is a long stretch of high water characterized by boiling eddies and high, irregular waves. Rocks dangerously jut out in the whitewater. No wonder the guides told us to paddle as hard as we can; negotiating a Class 4 needs precise maneuvering and power. 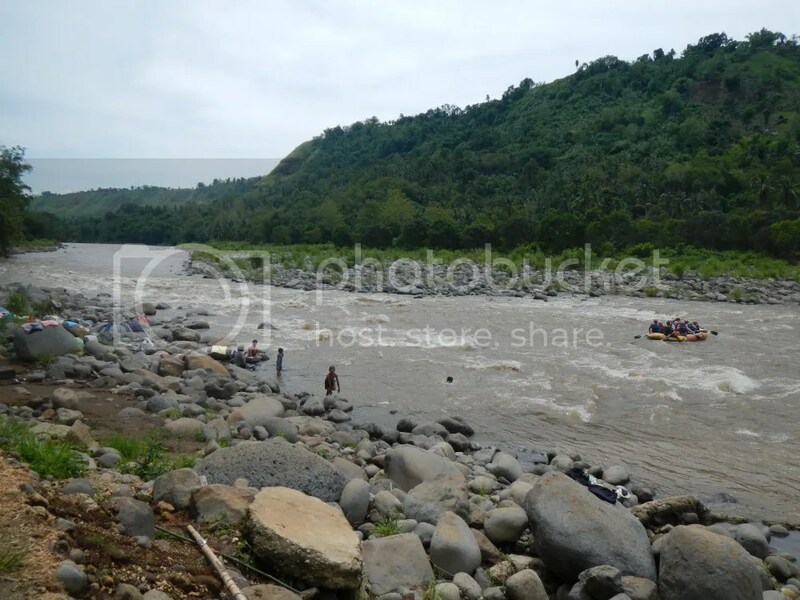 Most of the rapids in Cagayan de Oro River range from Class 2 to Class 4, with the majority in Class 3. 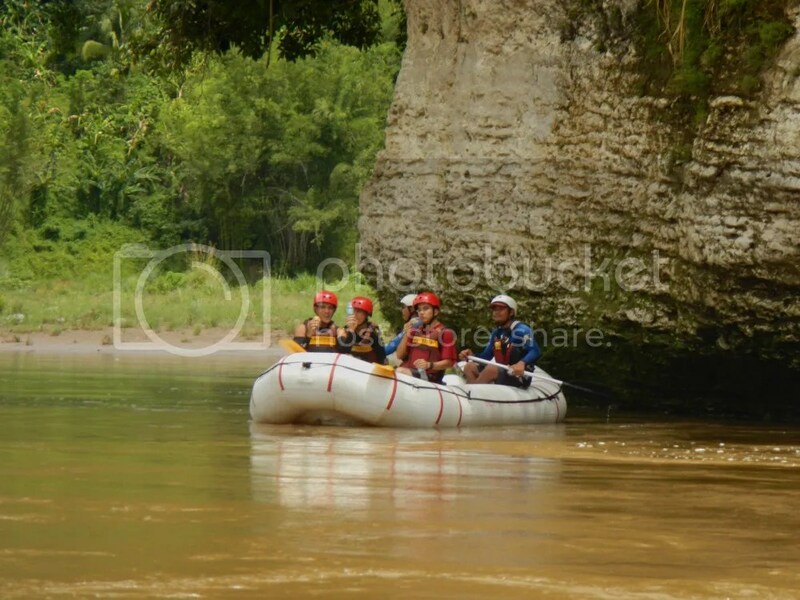 It has been 3 hours since we’ve paddled the Cagayan River, and we were looking forward to set foot on land again. But before arriving at the exit point, we encountered a lovely area of moss-covered canyons and jutting rock formations. From here, the platform of the Makahambus Cave became visible. After 4 hours of paddling, swimming, screaming, holding on, laughing, and having the time of our lives, we raised our oars for arriving at the end point and successfully completing the advanced rafting course. Wohoo! The guides called us Team Lakas—Lakas Sumigaw (literally means “shouts loudly), that is. Hehehe! Teamwork! After we congratulated each other, we were ready to go back to our outfitter’s office to refresh, take lunch, and rest. And we were treated to a filling, sumptuous lunch courtesy of our professional and awesome outfitter. The cool guys in red are our award-winning photographers, from left, Mark Lopez and Jessie Victorillo. They have won numerous photo contests in Cagayan de Oro. The guys wearing blue rashguards are our very skillful guides, from left, Ruben Victorillo and Johnmark Lamoste. A super thank you to the guides and staff of Great White Water Tours for a breathtaking, wet, wild, and adrenaline-inducing adventure! Great White Water Tours have new rates and packages. Click here for updated rates and packages. You can also get in touch with them through their Facebook page. Just log in to Facebook and search “Great White Water Tours”. * Please check the update above for link to new rates. 3. A minimum of 5 rafters is required per raft. You need to pay P700 (for Basic Course) or P1,000 (for Advanced Course) per empty slot if your group doesn’t reach the minimum number. If you’re just alone or with a group that is less than 5, contact the outfitter so they could insert you to another booked group. In our case, Sir Marc’s friends already paid for the slots, so even though there were only three of us, the adventure was a go. 4. 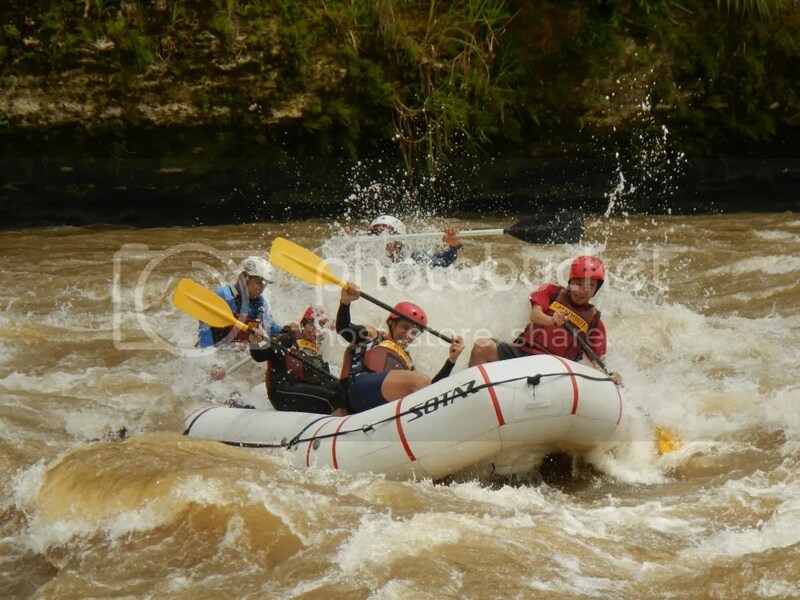 If you want to customize your package or if you want a rafting experience that goes beyond the Advanced Course, contact the outfitter to tailor your adventure for you. 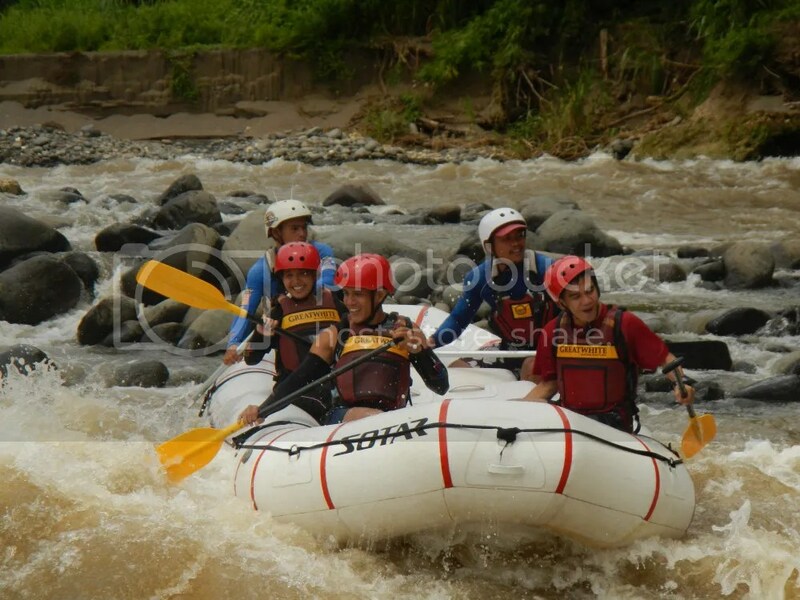 Additionally, Great White Water Tours can also offer packages that include adventures in Dahilayan Adventure Park in Bukidnon. 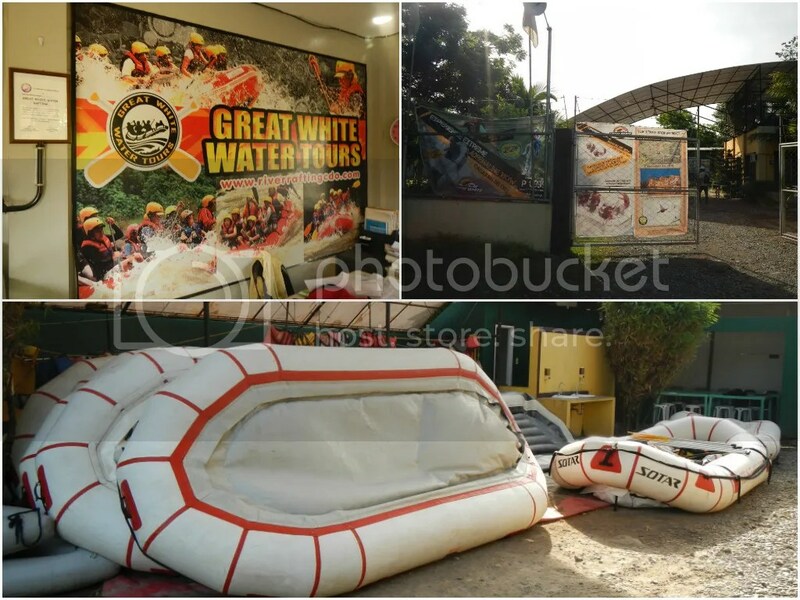 Visit the Great White Water Tours website for more information. 6. 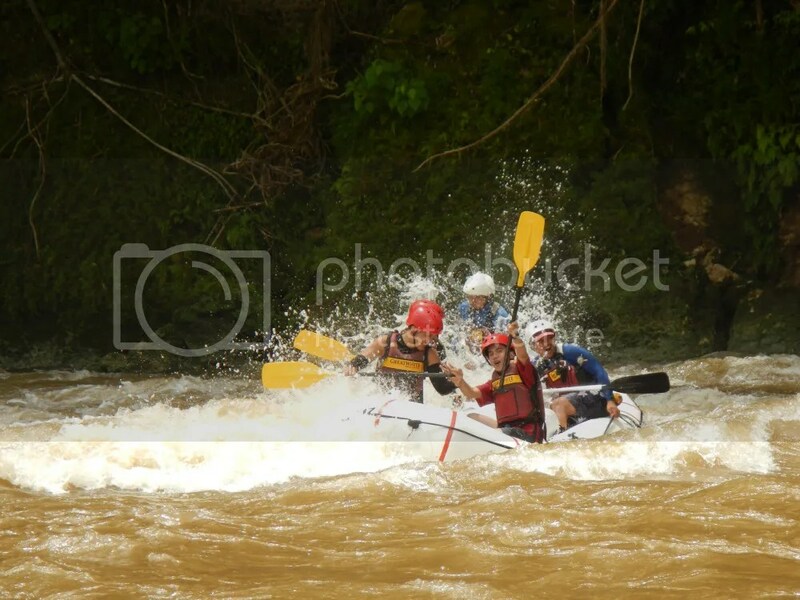 You may incur a small charge if you wish to have kayakers take photos of your adventure. Negotiate with the outfitter for your photography charge. There’s no charge at all if you let them use your cameras, but if not, you’ll pay a charge of P1,000 for the outfitter’s use of their own cameras. Oh, about cameras, don’t concern yourself about your expensive gadgets getting wet. Sirs Mark and Jessie are so skillful in this kind of photography that even Sir Marc’s expensive DSLR never had a drop of water on it! They use waterproof dry-bags to stuff your expensive camera in. 7. To avoid hassles and to ensure security, leave your backpack, bags, jewellery, and other belongings in the office. The staff places them in large stuff-sacks and padlocks them until you return from your trip. 8. Needless to say, there is no way to escape being wet in a whitewater rafting adventure. 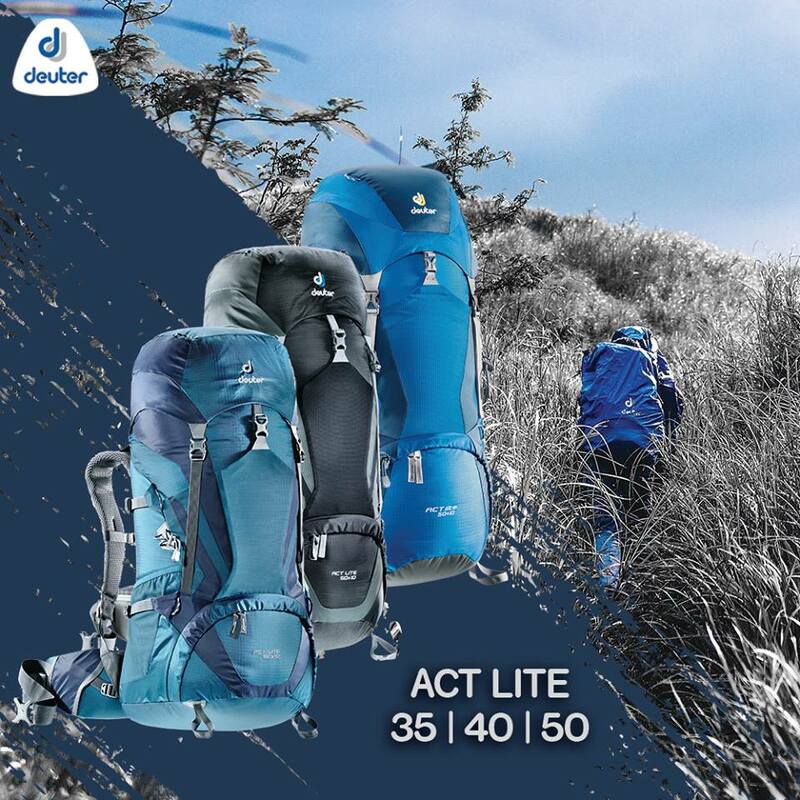 Thus, waterproof your belongings by putting them in drybags, plastic bags, or zip-lock bags. 11. Always listen intently to the guide as he gives you a briefing. 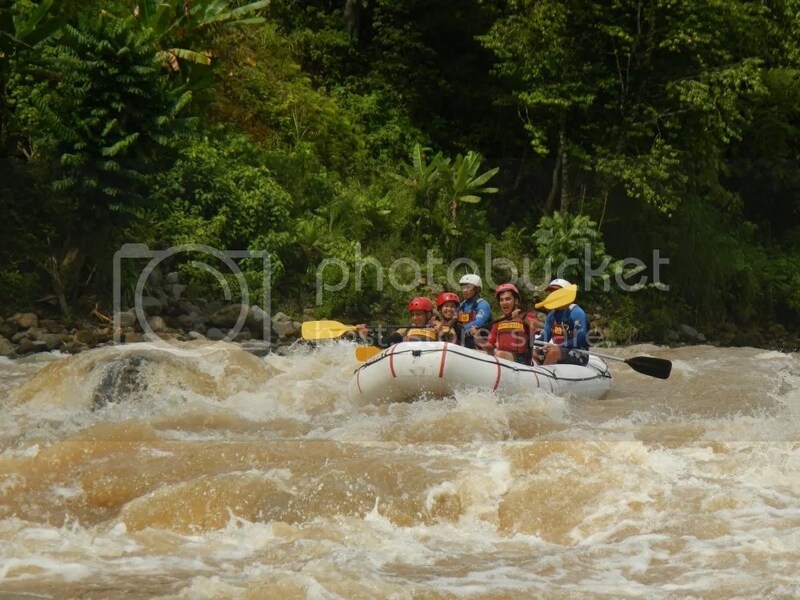 Whitewater rafting is considered an extreme sport, which means it can be dangerous. Remember, you are dealing with a strong, fast-flowing river so your safety is of primary importance. Your guide will tell you how to hold an oar properly, how to paddle the right way, what to do in case you fall, what to do in case a team-mate falls, how to position yourself if you fall to avoid crashing into the rocks, etc. wow! awesome adventure, indeed. tried that 3 years ago also at CDO (advance course). our guide was the best, he was making a lot of jokes throughout the adventure so our nervousness was lessened to a great deal. i was drifted away by the rapids when i failed to swim back to our raft after jumping from a rock. good thing our guides were quick enough to “rescue” me, otherwise i would have probably ended up in the open waters. hahaha! another adventure which is really a must try in CDO is the river trekking in mapawa nature park. it was one great adventure of a kind. Thanks for commenting. Yup, it was indeed awesome. Did you use Great White Water Tours as your outfitter? Their guides are very pleasant and humorous. We didn’t experience a wipeout but one of us fell at the rapids. Hehe! We’re planning to go back and try out the Advanced 2 Course or the Extreme Course. Thank you for your suggestion regarding Mapawa Nature Park. We’ll definitely make plans to visit the place. 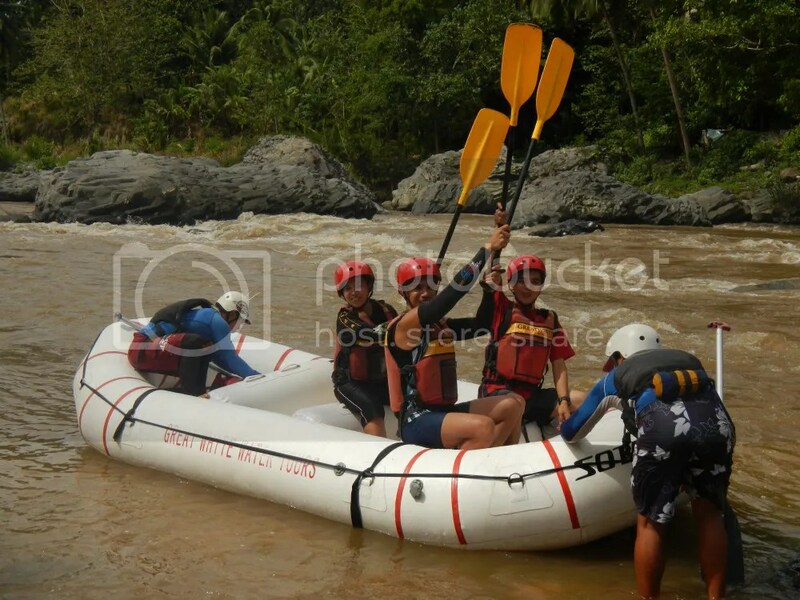 i think we used the First White Water Rafting- being the first water rafting outfitter in CDO, we wanted our lives to be placed with the most experienced and expert rafters and guides in town. tata was the name of our guide- very funny guy. we were so happy with his services we ended up giving him a large amount of tip 🙂 i also want to try the advance course B and perhaps the extreme course when i go back there in october. yeah, do no miss MAPAWA NATURE PARK next time. i miss this already. 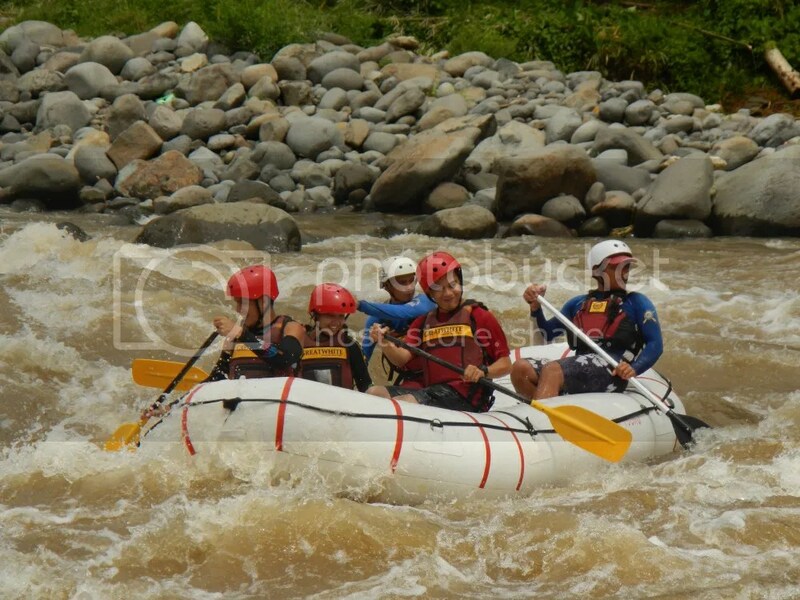 it’s been ages since i first (and last) tried whitewater rafting in cdo. Thank you so much for visiting our blog. Oh, you are very lucky you’re in Cagayan! 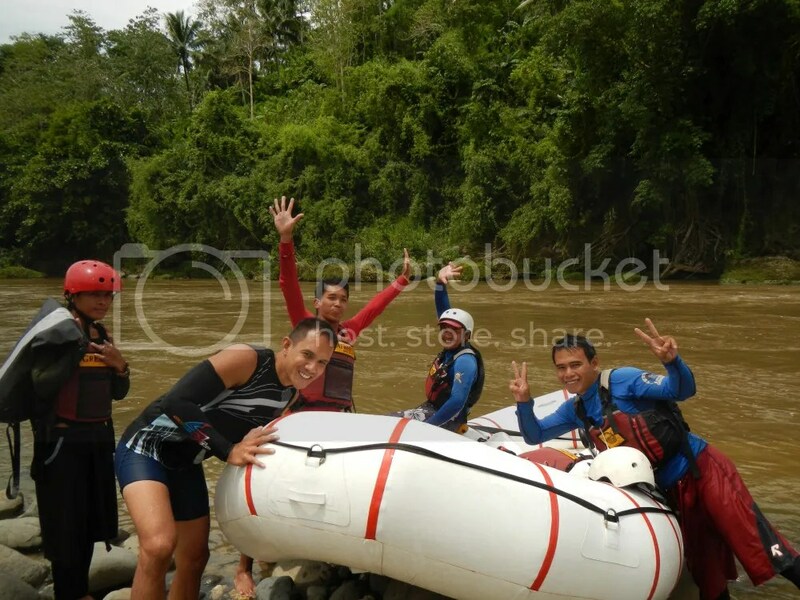 You have the best and biggest river for rafting in the Philippines! 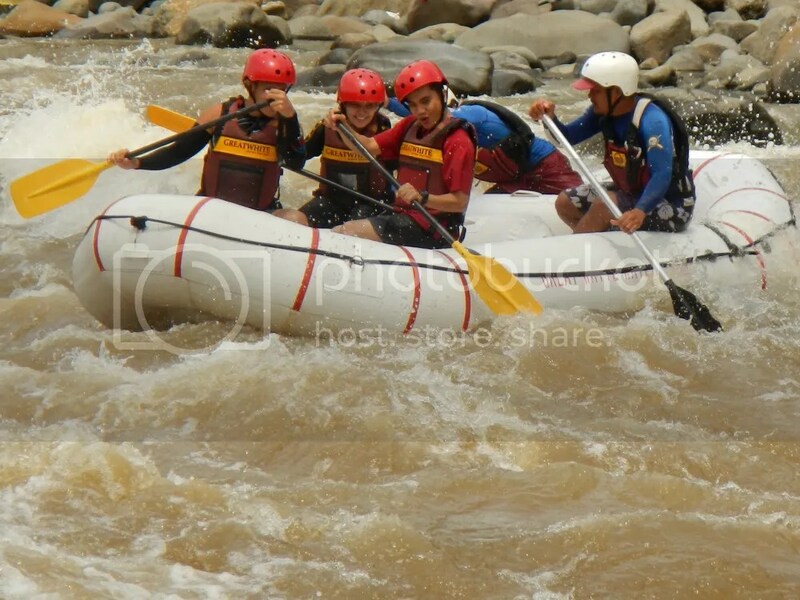 Can’t wait to experience my first white water rafting at Cdo this August! Just by reading your experience, lalo tuloy akong na excite. Water Rafting for me is dangerous but after I read this blog, It is now on my bucket list to do that this year with my friends so that I can finally experience that one. Cross-finger. We look forward to hearing about your rafting experience soon. 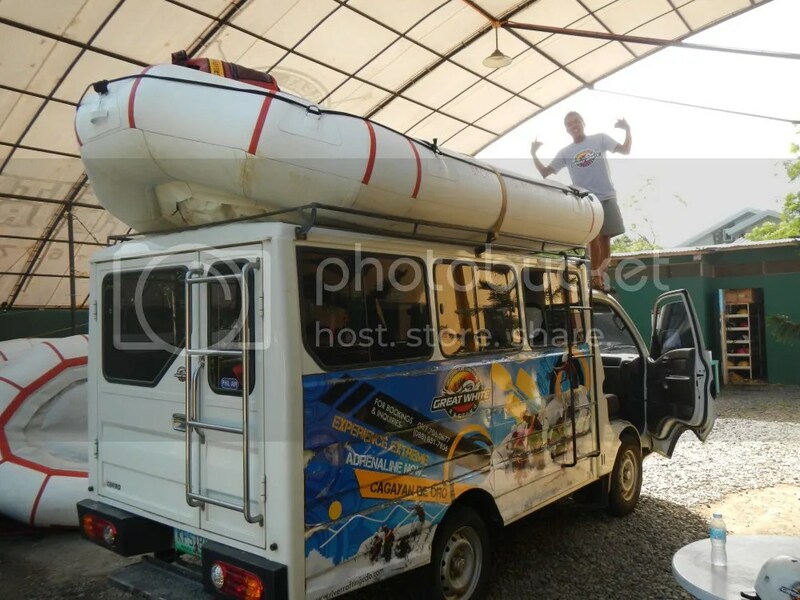 It’s an honor to have one of our adventure service providers visit our blog. Sure, please feel free to share our photos and blog post to your social media accounts. 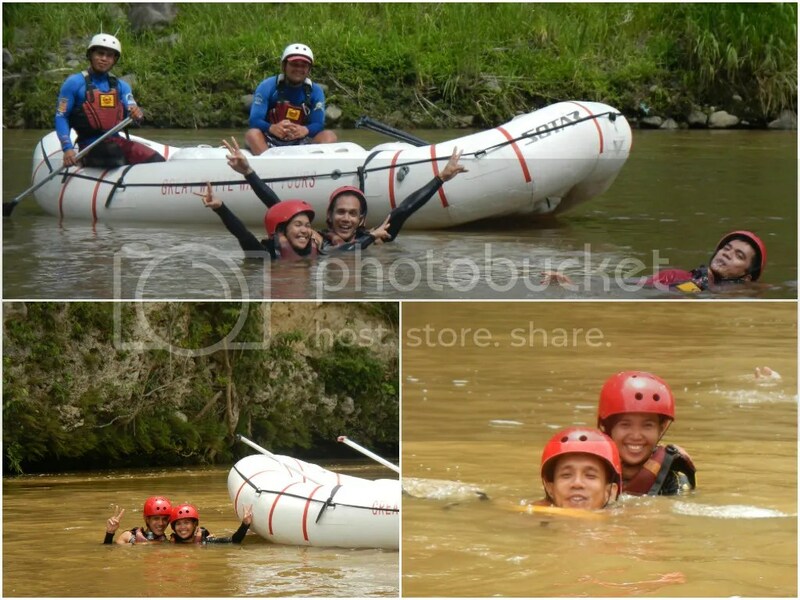 Because of your blog and awesome evidences of what’s fun adventure can be (pictures), I want to take round two (2) in White Water Rafting. Already tried it last month and until now, can’t get over with how it feels like and the fun I’ve experienced. 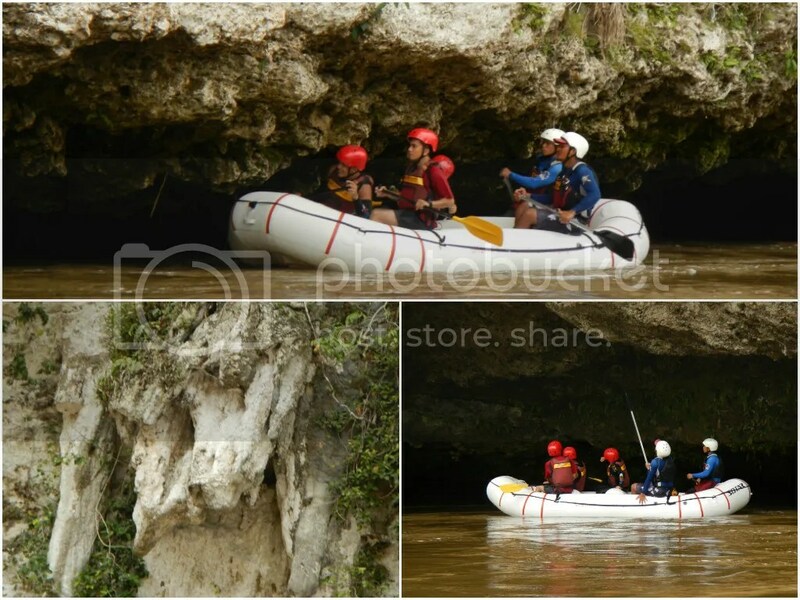 Thanks to Great White Rafting, we really enjoy the adventure . Also grateful to kuya Dodong (our favorite guide) for being so humorous and assuring that all of us will be safe. 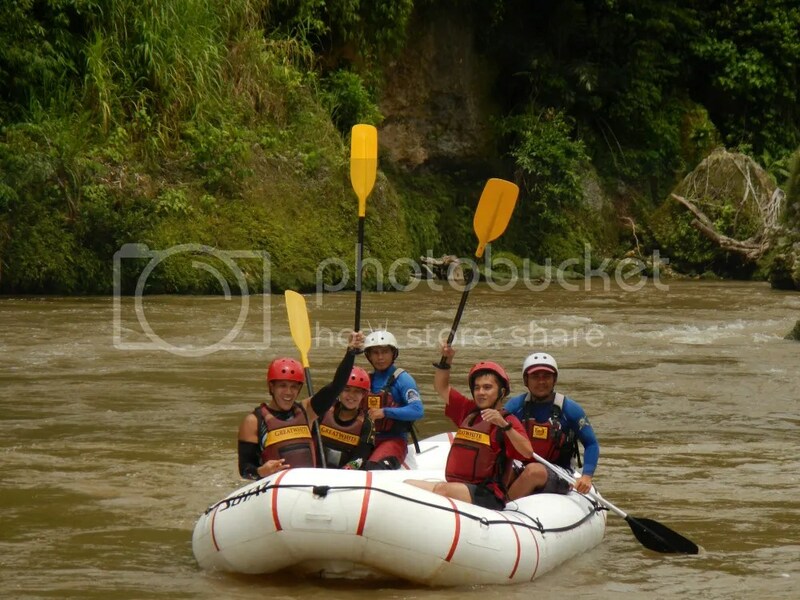 White water rafting is Cagayan de Oro’s pride. I’m glad you enjoyed your experience. Oh, yes! In fact, we’re planning to go back there and try out their extreme course. 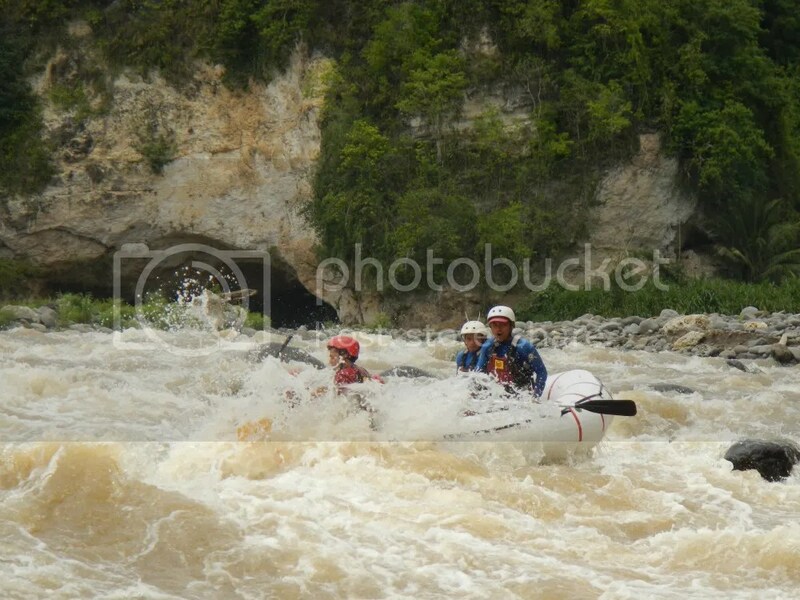 We also asked if whitewater kayaking is offered; all the outfitters we asked answered in the negative. 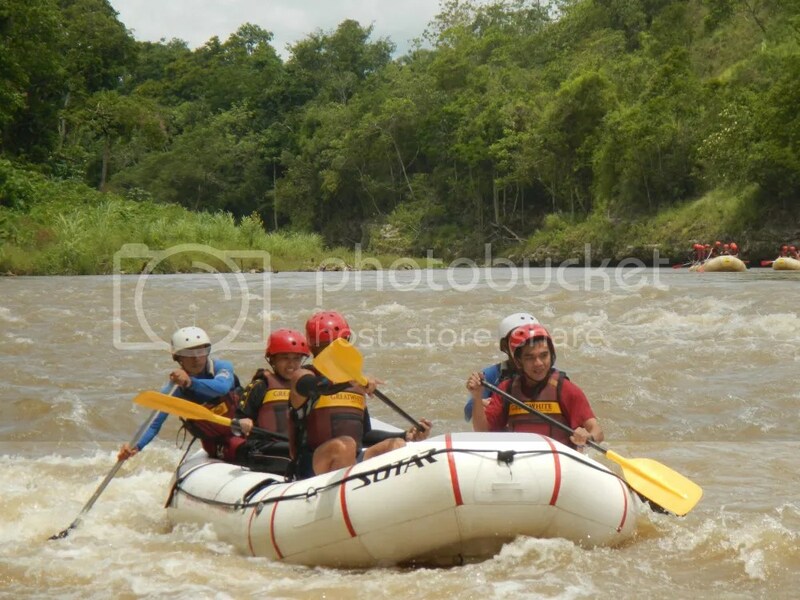 I still have to try white water rafting in Cagayan de Oro. I heard from my friend there that the prices increased recently. Don’t worry about the prices; increases are normal due to inflation. The experience is worth more than the price. You won’t regret it; whitewater rafting is extremely fun! Wonderful post! It’s really good for those who are wild adventurer.